On June 15th, I visited the embassy of the Republic of Myanmar and talked with Ambassador Thurain Thant Zin. I also invited Mr. Suematsu Yoshinori, a member of the house of representatives to come as well since he is very knowledgeable about Myanmar. Myanmar was formerly called Burma, and is quite well known to the Japanese. When hearing the name Myanmar, many Japanese people would probably think of Aung San Suu Kyi’s struggle for democracy and the novel “The Burmese Harp” by Takeyama Michio. During our talk, the Ambassador expressed his gratitude for the support Myanmar received from Japan during their democratization process. Currently, Myanmar is involved in many projects of economic development and is relying heavily on foreign investment. It was mentioned that investment from Japan will be especially appreciated. 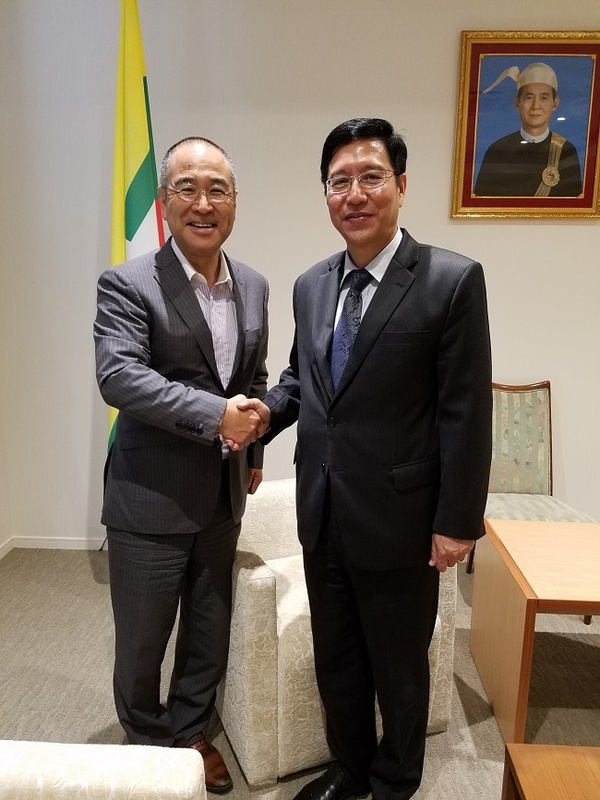 Additionally, the Ambassador stressed his thoughts on the importance of both countries understanding one another on a civilian level, and expressed his wishes that Japan and Myanmar will prolong and deepen their relations in the future. Wholeheartedly agreeing to these values, I shared a memory from over 30 years ago when I visited Myanmar. The taxi driver that I talked to was so fluent in Japanese I inquired why he was so good. His answer was that during the second World War, he saved many lives of Japanese soldiers who were on the brink of death. After the war, the soldiers whom he saved sent him a minivan as a token of their gratitude, which was the very car that I was riding in. Despite the unfortunate situation they were in because of the war, such friendships were able to be established between the Japanese and Myanmar people. We believe that this friendship has been passed on and is still alive today. Relations like these between the general people is something that is highly important to Tokyo, as they are about to host the Olympics. I expressed my wish that we can gain the support of the people of Myanmar. Le 15 juin 2018, j’ai rendu visite à Monsieur Thurain Thant Zin, ambassadeur du Myanmar. J’ai demndé de m’accompagner à Monsieur Yoshinori Suematu, député à la Diète, qui connaît bien la situation au Myanmar. Le Myanmar, autrefois appelé la Birmanie, est un pays familier aux Japonais. Pour beaucoup de Japonais ce sont sans doute deux mots qui viennent immédiatement à l’esprit. Le nom de madame Aung San Suu Kyi qui s’est efforcée de démocratiser son pays et ensuite le roman intitulé la « Harpe de Birmanie » de Michio Takeyama. Monsieur l’ambassadeur a remercié le peuple japonais qui apportait au peuple du Myanmar de différents soutiens dans le processus de la démocratisation du pays. Actuellement le Myanmar a de nombreux projets de développement économique et espère obtenir des investissements étrangers, notamment ceux du Japon. Monsieur Thurain Thant Zin a souligné d’ailleurs l’importance de la compréhension mutuelle au niveau du peuple. Il est content de constater que les deux pays aient une bonne image mutuelle historiquement. Il a déclaré qu’il aimerait voir s’approfondir des relations amicales désormais. Encouragé par ces propos j’ai raconté l’expérience personnelle d’il y a plus de 30 ans. Lors de la visite du Myanmar, j’ai pris un taxi dont le chauffeur parlait très couramment le japonais. Je lui ai demandé pouquoi. L réponse était très émouvante. Pendant la Seconde Gurre mondiale, en collaborant avec l’armée japonaise, il a sauvé à plusieurs reprises la vie des soldats japonais en situation dangeureuse. Après la guerre, d’anciens « camarades de guerre » japonais l’ont invité au Japon pour exprimer leur grattitude et lui ont fait don d’un minibus. C’était justement cette voiture que j’ai prise sur place. L’amitié née dans une situation malheuse entre les Japonais et les Birmans se transmet aujourd’hui. Le développement des échanges au niveau des citoyens est important pour Tokyo qui accueillera les Jeux Olympiques dans deux ans. J’ai demandé à l’ambassadeur l’appui du peuple du Myanmar à cette manifestation très importante pour Tokyo et sa population. On May 24th, I visited Ambassador Joseph Giraud Effangone-Obaghe of the Republic of Gabon. Gabon is a small country with a population of about 2 million, but they are rich in various natural resources—especially uranium, manganese, and iron ore—and the general income of the people are rather high. According to the Ambassador, Gabon is currently focusing on economic and industrial policy changes to increase their capacity to process these resources in their own country, and increase their export of these products. In order to do this, Gabon requires foreign technology so we hope that Japan can help in this process. Gabon is also a country abundant in nature. Along the Atlantic coast spreads a wide area of forestry which is the country’s nature reserve, and in the famous Loango National Park there are wild gorillas and Hippos. Since there are movements of rapid industrialization in the country, the Gabonese government has established a special sector that overlooks the balancing of industrialization and the preservation of their environment. When I introduced my Africa Mirai Project idea of inviting African graduate students to come study in Japan, Mr. Effangone-Obaghe seemed highly interested. He explained that although the education system is well established for elementary and junior high schools, anything beyond that is not solid yet. In that sense, offering new chances to let their students study abroad was very much appreciated and it was expressed that they would like to be kept up to date with the progress of this project. Le 24 mai 2018, j’ai rendu visite à monsieur Joseph Gillaud EFFANGONE-OBAGHE, ambassadeur de la République du Gabon. Bien que le Gabon soit un petit pays avec sa population de moins de deux millions d’habitants, il est doté, en plus du pétrole, de diverses ressources minérales – l’uranium, le manganèse, le minerai de fer en particulier. Son revenu national est relativement élevé. Selon l’ambassadeur, la politique économique et industrielle du gouvernement gabonais actuel est de mettre en place un processus de production qui permet d’augmenter le taux de façonnage des matières premières en y ajoutant plus-values avant de les exporter. A cette fin il est nécessaire d’introduire des technologies venant d’outre-mer. Monsieur Effangone-Obaghe souhaite que les entreprises japonaises participent plus activement au développement industriel de son pays. Le Gabon est aussi un pays favorisé par la nature. Sur la côte atlantique, s’etend une ceinture verte qui est désignée comme réserve naturelle et zoologique. Des animaux sauvages tels que les gorilles, les hippopotamus peuvent être vus dans le célèbre « Parc national de Louango ». Pour cette raison, il est important de savoir comment rendre compatible la politique d’industrialisation préssnante et la politique de protection de la nature. Le gouvernement gabonais essaie de coordonner les deux politiques en plaçant une institution spécifique au niveau du gouvernement central. Au Gabon l’enseignement primaire et secondaire est assez bien aménagé, mais l’enseignement supérieur nécessite des réformes importantes. En ce sens, il est utile d’offrir la possibilité aux étudiants gabonais d’étudier à l’étranger. Lorsque j’ai présenté le « Africa Future Project » qui offre aux jeunes africains l’opportunité d’étudier dans les universités japonaises, monsieur l’ambassadeur, intéressé par ce projet, demande de le tenir au courant du progrès du projet à l’avenir. On May 23rd, I visited Ambassador Makarimi Abissola Adechoubou in the new building of the Benin Embassy. All of the people in the Embassy were young and some of them studied Japanese in Japan, and the meeting was a very fun experience. 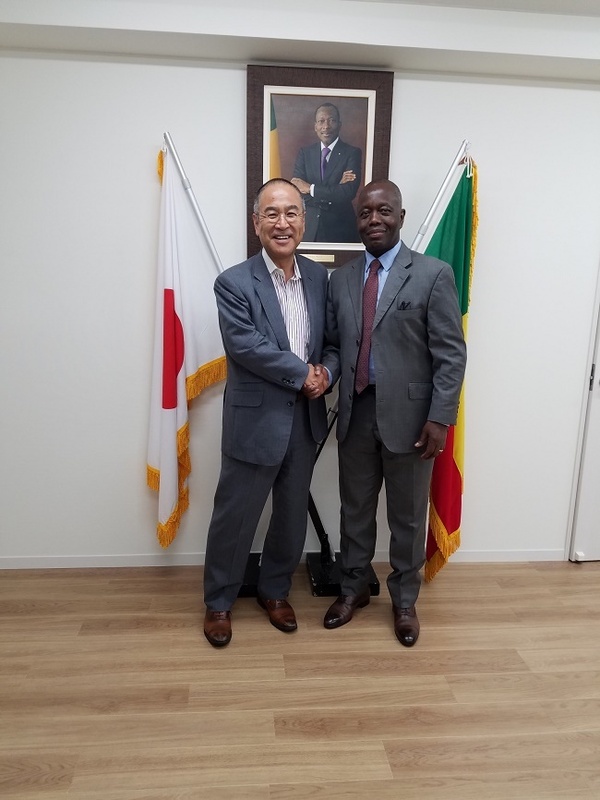 According to the Ambassador they do not know exactly how many athletes will come to represent Benin in the 2020 Tokyo Olympics, but track and field, judo, fencing, and swimming are all very popular sports in the country so they expect to have as many athletes possible compete in those fields. According to the Ambassador, educational reform is currently the most important agenda in Benin. However, speedy reform can not be expected without some support from other countries. In the case of Japan, there is the “Abe Initiative” which enables foreign students to come study in Japan, but there are only about four or five students from Benin who use this program—so we hope that number grows. Switching subjects, there is one person who became famous both in Japan and in Benin. That person is Mr. Zomahoun. He had studied in Japan and had become popular as a television personality as well, and even became the Ambassador for Benin in Japan. 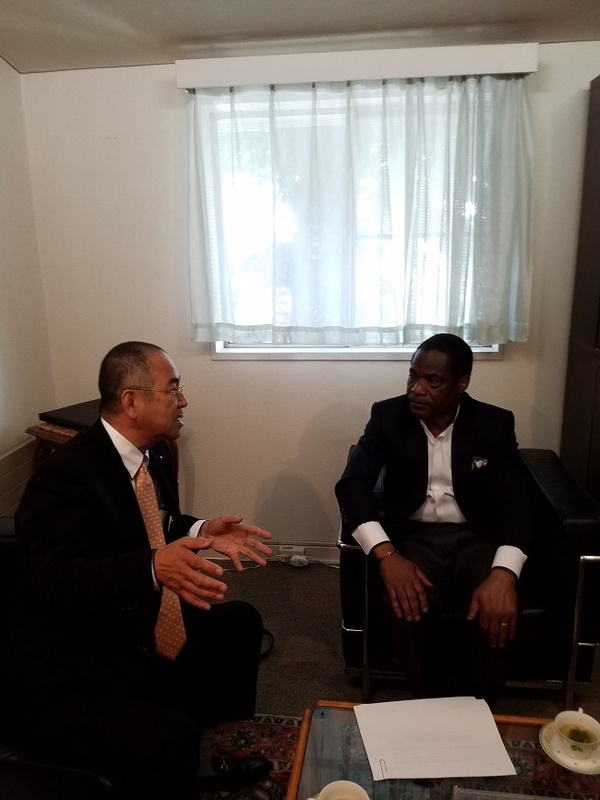 Mr. Adechoubou noted that he hopes there will be more people from Benin who can thrive in Japan in the future. It was mentioned that one reason why there are not many exchange students from Benin is because of the language barrier. In Benin, French is widely used so if one chooses to go abroad to Japan, they must learn Japanese and English. Before, there were not many opportunities for people to learn Japanese but recently there has been Japanese language schools in Benin as well, so hopefully there will be more exchange students in the future. We hope Mr. Adechoubou’s wishes come true. Le 23 mai 2018, j’ai rendu visite à Monsieur Makarimi Abissola ADECHOUBOU, ambassadeur de la République du Bénin, dans un nouveau bâtiment de l’ambassade récemment emménagé. Tout le personnel de l’ambassade était jeune et certains ont appris le japonais au Japon. L’entretien avec l’ambassadeur et son équipe était intéressant et amical. Selon l’ambassadeur, il ne sait pas encore combien de Béninois participent aux Jeux Olympiques de Tokyo. Mais puisque les Béninois aiment beaucoup le sport, par exemple l’athlétisme, le judo, l’escrime, le gouvernement veut envoyer une délégation aussi nombreuse que possible. La réforme de l’enseignement des jeunes est une préoccupation majeure du gouvernement béninois. Cependant il est difficile de la réaliser tout seul sans aide étrangère. Il y a des jeunes Béninois qui étudient au Japon dans le cadre de l’Initiative Abe dont le nombre total reste encore 4 ou 5 personnes. Monsieur Adechoubou s’attend à ce que le nombre d’étudiants augmente à l’avenir. D’ailleurs il désire parler d’une personne, qui est devenue célèbre au Bénin et au Japon. C’est le cas de Monsieur Zomahoun. Après ses études au Japon, il est devenu une vedette de télévision japonaise avant de devenir ambassadeur du Bénin. Monsieur Adechoubou s’attend à ce que les Béninois en activité au Japon deviennent beaucoup plus nombreux. Une des raisons pour lesquelles les étudiants béninois restent peu nombreux au Japon, c’est le problème de langues. Le Bénin étant un pays francophone, les étudinats qui veulent étudier au Japon doivent apprendre le japonais et l’anglais. Mais peu sont des jeunes Béninois qui ont de la possibilité d’étudier ces deux langues étrangères. Heureusement une école de langue japonaise a été fondée au Bénin il y a peu de temps. Les jeunes Béninois partiront étudier au Japon après avoir appris le japonais dans cette école. Je souhaite que le rêve de l’ambassadeur devienne une réalite dans un proche avenir. Copyright (C) 2008-2017 Shigeru Ishige. Allrights Reserved.